Raumfahrt+Astronomie-Blog von CENAP - Blog: Mars-Curiosity-Chroniken - Curiosity Rad beschädigt! A photograph taken by Curiosity's robotic arm-mounted Mars Hand Lens Imager (MAHLI) on Dec. 20 (Sol 488) shows marked wear and tear on the rover's front left wheel. 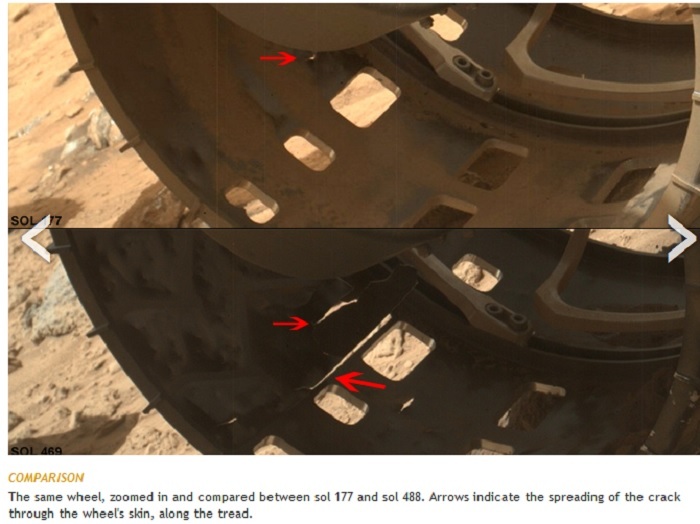 Punctures in the rover's thin aluminum are highlighted by the arrows. 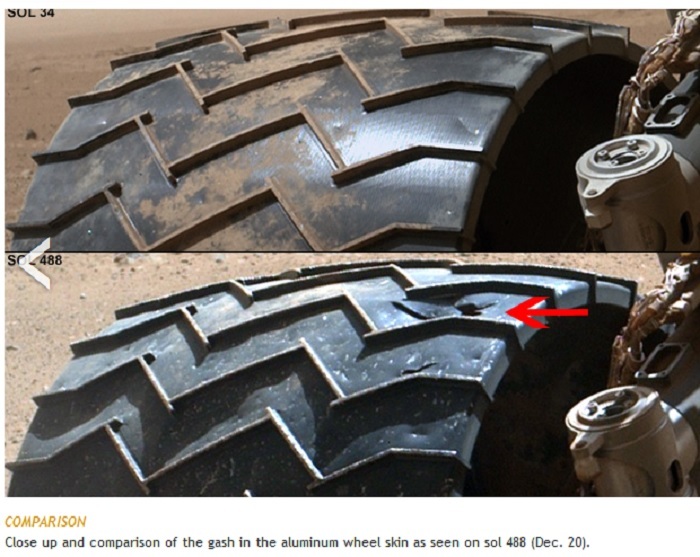 n May, Discovery News reported the dramatic signs of wear and tear on Mars rover Curiosity’s wheels. The aircraft-grade aluminum material appeared scratched, dented, even punctured. At the time, lead rover driver Matt Heverly said that the damage was to be expected. “The ‘skin’ of the wheel is only 0.75mm thick and we expect dents, dings, and even a few holes due to the wheels interacting with the rocks,” he said via email. Despite the assurances that the holes were just a part of Curiosity’s mission, there seems to be increasing concern for the wheels’ worsening condition after the one-ton robot rolled over some craggy terrain. In an upcoming driving activity for Curiosity, rover drivers will command Curiosity to rove across a relatively smooth area of the Martian surface. Throughout the drive, Curiosity’s powerful MAHLI camera, which is mounted to the end of the rover’s robotic arm, will monitor the condition of the wheels. Curiosity has recent endured some challenging terrain laced with sharp rocks protruding from the ground. These rocks have caused some perforations in the six wheels, sometimes peeling back flaps of cut aluminum. Depending on the outcome of the upcoming monitoring session, mission managers may need to better factor in the roughness of terrain of Curiosity’s future drives, re-routing if necessary. Since landing inside Gale Crater in August 2012, Curiosity has driven a little under three miles, so damage to the wheels was going to be inevitable. But the rover hasn’t even begun the tough drive up the slopes of Aeolis Mons (Mount Sharp), a 5.5 kilometer-high mountain in the center of the crater — the ultimate goal of the mission to piece together the habitability puzzle of the red planet. There will undoubtedly be some tense times ahead for the rover team, especially if the rough terrain continues to chew up the six aluminum wheels. NASA's Mars rover Curiosity captured this stereo view using its Navigation Camera (Navcam) after a 17-foot (5.3 meter) drive on 477th Martian day, or sol, of the rover's work on Mars (Dec. 8, 2013). The scene appears three dimensional when viewed through red-blue glasses with the red lens on the left. It spans 360 degrees, with south at the center and north at both ends. This drive brought the mission's total driving distance to 3.86 miles (4.61 kilometers). The rock-studded terrain Curiosity has traversed since October 2013 appears to have accelerated the pace of wear and tear on the rover's wheels. Future drives may be charted to cross smoother ground where available. This seam-corrected mosaic is presented in a cylindrical-perspective projection. The team operating NASA's Mars rover Curiosity has completed a software upgrade on the vehicle and is next planning a check of wear and tear on the rover's wheels. "Curiosity is now operating on version 11 of its flight software," said Jim Erickson of NASA's Jet Propulsion Laboratory, project manager for the NASA Mars Science Laboratory Project, which operates Curiosity. This is the third upgrade version since Curiosity's landing on Mars16 months ago. Completing the switch from version 10 took about a week. An earlier switch to version 11 prompted an unintended reboot on Nov. 7 and a return to version 10, but the latest transition went smoothly. These upgrades allow continued advances in the rover's capabilities. For example, version 11 brings expanded capability for using the Curiosity's robotic arm while the vehicle is on slopes. It also improves flexibility for storing information overnight to use in resuming autonomous driving on a second day. An upcoming activity will be driving to a relatively smooth patch of ground to take a set of images of Curiosity's aluminum wheels, using the Mars Hand Lens Imager (MAHLI) camera at the end of the rover's arm. "We want to take a full inventory of the condition of the wheels," Erickson said. "Dents and holes were anticipated, but the amount of wear appears to have accelerated in the past month or so. It appears to be correlated with driving over rougher terrain. The wheels can sustain significant damage without impairing the rover's ability to drive. However, we would like to understand the impact that this terrain type has on the wheels, to help with planning future drives." Curiosity's recent driving has crossed an area that has numerous sharp rocks embedded in the ground. Routes to future destinations for the mission may be charted to lessen the amount of travel over such rough terrain, compared to smoother ground nearby. NASA's Mars Science Laboratory Project is using Curiosity inside Gale Crater to assess ancient habitable environments and major changes in Martian environmental conditions. JPL, a division of the California Institute of Technology in Pasadena, built the rover and manages the project for NASA's Science Mission Directorate in Washington.